So Did We Learn Anything? Equities start the day higher as earnings season winds down. So did we learn anything? Are there any takeaways at all? Hard to say, but earnings growth is still falling faster than dire wolves in Westeros. As you can see in this fancy orange bar chart I grabbed off Bloomberg earnings growth is something awful like -8% this quarter. Blah. That being said, the world thinks this was the trough and we have nowhere to go but up. Are they right? Who knows, but unless the Dollar remains weak and Crude oil remains strong that upward trajectory may just turn down again. Speaking of turning down, who else is beyond bored with the Danerys storyline? Jesus can she stop saying her stupid 18 word name for one freaking episode? I don’t care that you are unburnt or queen of the Andals, take a shower will you? So what are the catalysts out there now that earnings are fading into the twilight? 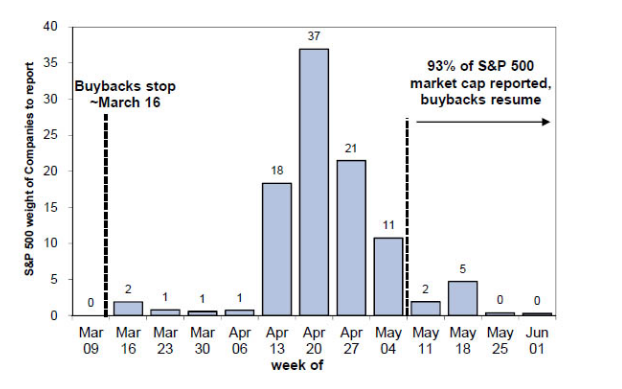 How about buybacks!! Everyone’s favorite “it’s really the only reason stocks go up” meme is ready to return to your world. The buyback window is finally re-opening (credit to GS) so maybe this slow grind lower we’ve endured over the past two weeks will finally catch a bid. Are buybacks the panacea that will save us from the depths of misery? Of course not, but at least they help on the margin. Unfortunately it looks like we are doomed to the fate of sissyphus. Push the rock up the hill (hey things aren’t that bad), get near the top (we’re about to breakout! ), slip (oh wait things aren’t exactly fixed are they), rock slides downhill (oh man here comes the recession and earnings collapse), and we walk down to start all over. We closed at 2,057 on Dec 31, 2014. We opened today at 2,057. I mean they write Twilight Zone episodes about this kind of stuff. After the open I spent the first 4 hours looking for something to write about and came up empty. I mean if I were a journalist at the WSJ or Marketwatch I woulda called in sick. “Hey, let the intern try to describe an unchanged market with no macro data, I got a cough!” Ok something must’ve happened right? Sure, KKD got a $21/shr offer from Germany’s JAB group. $1.35B for the world’s best donuts? You bet. You know what else JAB owns? Keurig, Peets, Jimmy Choo, and Einstein Bagels to name a few. So if you are woman who loves super high heels with your coffee and donuts these guys got you covered. Wait… Jimmy Choo makes men’s shoes too? Honestly I had no idea but I’m definitely not in the $650 loafer category (you junior bankers are though! Hit up this link and impress your MD because those Excel skills are probably lacking am I right?) Where was I? Oh yea a market that went nowhere for the first half of the day. Look, there’s no economic data at all until Friday so we’re gonna need someone to say something controversial (luckily its Politics season). Winners MNK, AGN, CMG, HCP, VRTX, and BIIB. Mostly health care stocks because felines who impact the pavement sometimes produce upward velocity thereafter. Losers were FCX, CHK, RIG, DO, NEM, basically every energy and material stock. By lunch we sat on unchanged going absolutely nowhere fast. The rest of the day should’ve been spent calling our Mothers and thanking them for being awesome because come on, don’t just do it on Mother’s Day. Mothers are the greatest people in the world so tell them that more often. There’s an old jewish proverb that says “God could not be everywhere, and therefore he made mothers” so call her up again, make her night! We closed unchanged on the day and there honestly isn’t one thing I want you to take away from May 9, 2016 other than……….The Cubs are winning the World Series!!!!!! BOOK IT!!!!!!! Final Score: Dow -19bps, S&P500 +8bps, Nasdaq +30bps, Rus2k +32bps. Well there are none. Literally none. But I do have an amazing video to end on tonight so let’s move to the big finish.